The trend is for IT infrastructure to help organizations contribute more toward achieving their business objectives. Many IT teams must do so with shrinking budgets. In this environment, you probably can’t hire all the capable IT talent you need. As a result, you can’t run all your IT operations as well as you want. Do you need help operating, maintaining, and supporting your infrastructure? Or help running your applications and managing your workloads? How is Managed IT Service Different from Regular IT Service. With Managed IT Services, you delegate your operational and support duties to DSM. We keep your infrastructure up to date and at peak performance. We can run your workloads and applications for you. We also provide maintenance and support services. When you hire DSM to manage your information systems and data, you choose either of two levels of managed IT services. Our monitoring service, included in both packages, constantly checks the operation of your core business applications to ensure their availability. Critical services such as backups running properly. The system sends an alert when something doesn’t go as planned. Underlying infrastructure components. We know if a task isn’t working or if the system is running out of storage or compute capacity. Connectivity. We know when an ISP or some other factor is causing interruptions. We work with them to resolve the issue. We also work with you to design your network for resiliency when ISP issues occur. The monitoring service generates alerts and automatically enters them into DSM’s ticketing system. If DSM supports your equipment on your premises, we also monitor temperature, humidity, moisture, and connectivity in your server room. At the complete level of managed services, DSM also maintains devices such as printers and desktop or laptop computers and tablet devices. DSM’s managed services experts provide all the help you’re likely to need. You have access to our full range of high-grade skillsand talents. DSM’s bench strength supplements your team’s skills in areas where they may have little experience, such as disaster recovery. Many of DSM’s professional staff would normally cost too much for most mid-sized IT organizations. DSM’s Managed IT Services save you money by splitting the cost of these high-cost resources among multiple DSM clients. You use our specialized experts only when you need them. By paying only for the services you use, you greatly reduce your total maintenance and support costs. Free up funds and focus more attention on what matters: Your customers and employees. Your vision. DSM’s skilled and experienced staff help organizations get results faster than they may be able to achieve on their own. Your infrastructure may be located on your premises, colocated in a DSM data center, or in the Cloud. We can manage it for you, wherever it is. Your monthly fee varies with the complexity of your environment and the level of service you choose. 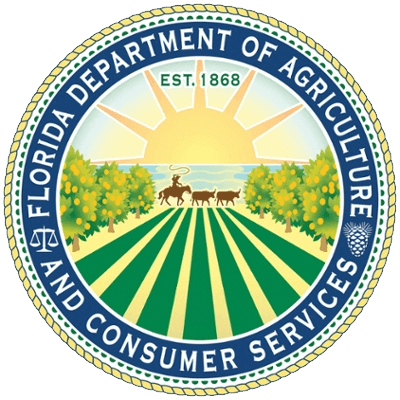 Once those variables are set, you avoid budgetary surprises. All the DSM IT services staff are certified for HIPAA, CJIS, PCI, SOC, and SSAE16 standards. DSM provides full technical support 24x7x365. DSM stays current with new technologies that make it possible to run your IT operations more efficiently. We’ll help you keep up with the pace of change. Give your team a breather - If your IT staff is under-resourced or overworked, DSM can offer the relief they need to get caught up. 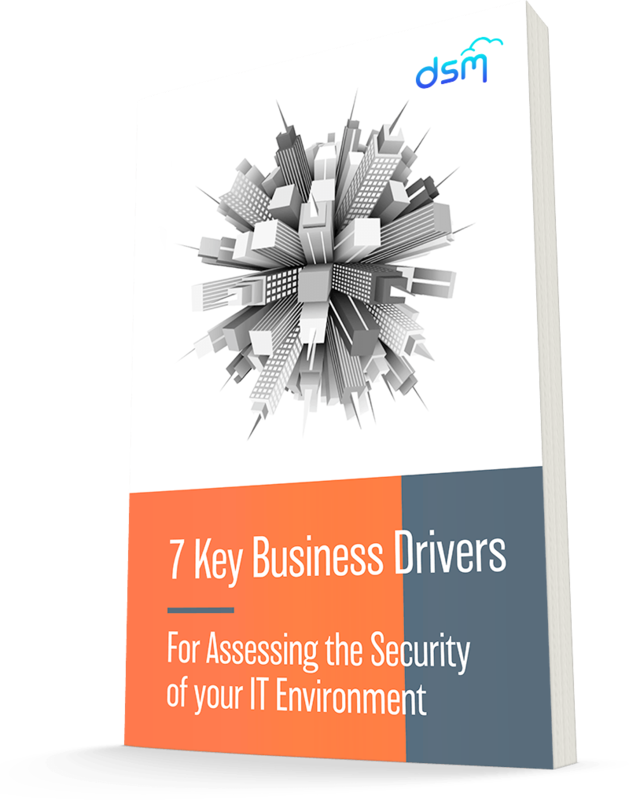 Learn why it makes good business sense to assess the risks of your IT operations. 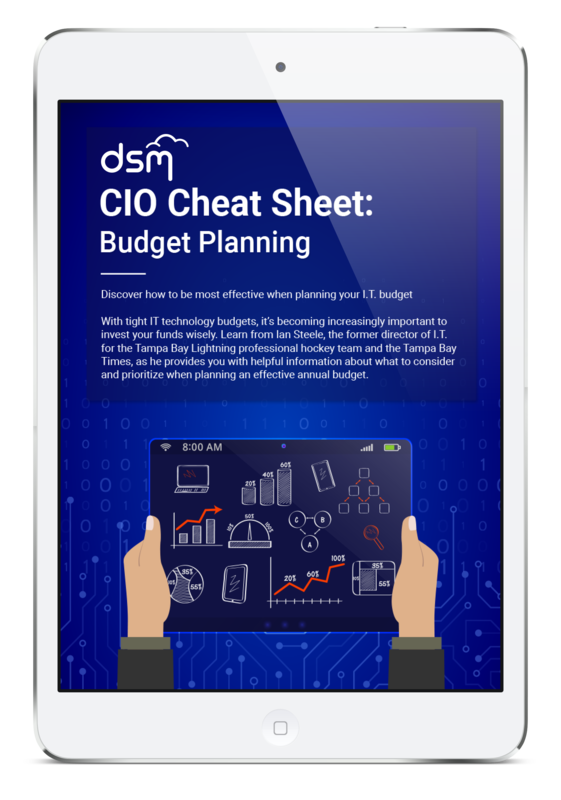 Discover how to be most effective when planning your IT budget. 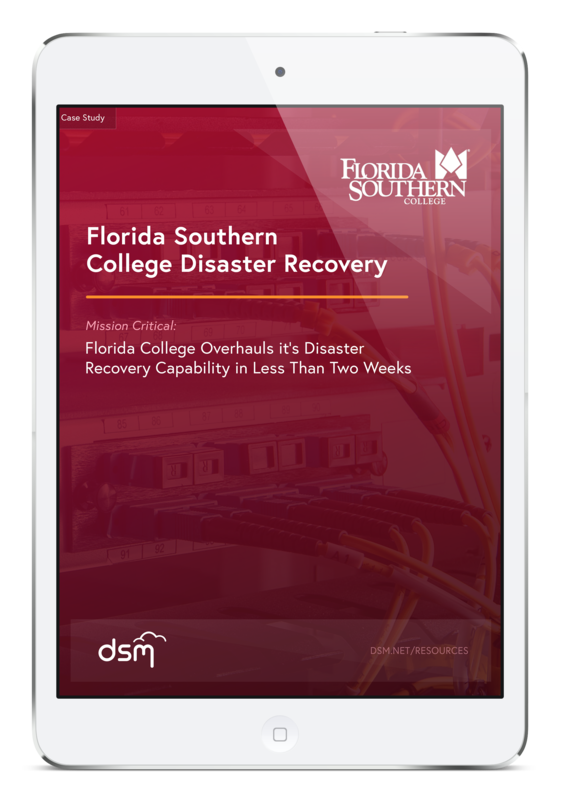 This brief case study explains how DSM helped Florida Southern College overhaul it's disaster recovery capability in less than two weeks!